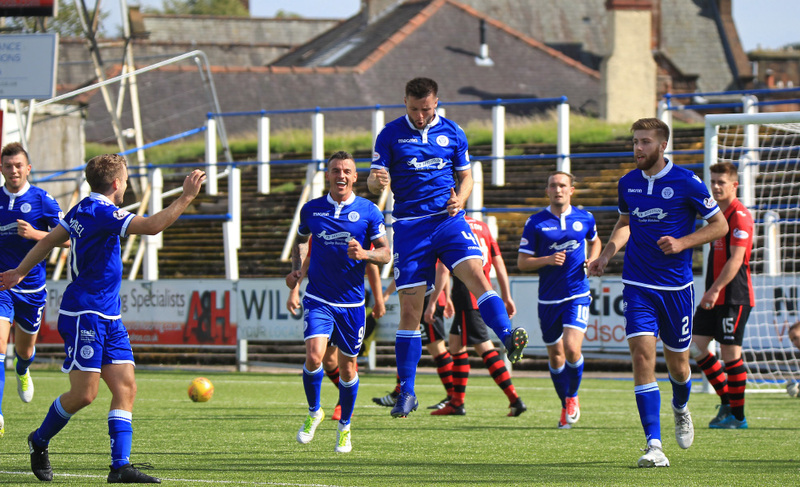 A single headed goal from central defender Callum Fordyce a minute before the interval proved to be the defining moment as Queens made it two out of two home league wins to climb up to third place in the Championship league table. After the midweek cup win, Queens made two changes to the team that started against Airdrie as Alan Martin returned in goal, and Shaun Rooney got the nod over Jason Kerr at right back. 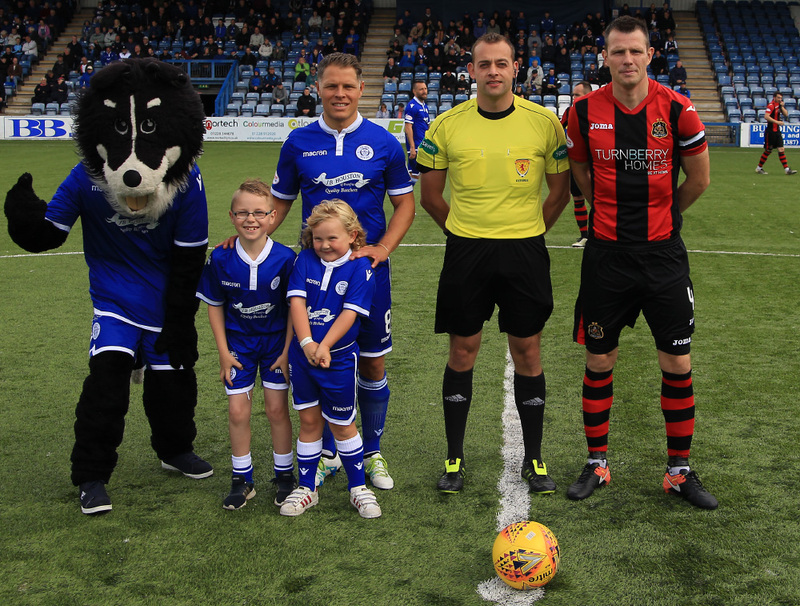 The visitors were captained by the returning Andy Dowie, and after playing 150 times for Queens, it took a bit of getting used to seeing him turning out for the opposition. We started with the same 4-3-1-2 formation that served us well in midweek, and straight from the kick-off we were on the front foot winning an early corner which was eventually cleared by a combination of Dowie and Carswell. Our next attack saw us create the first of several half chances when Carmichael and Lyle linked well to set up a shooting opportunity for Dobbie, but his low shot went wide. 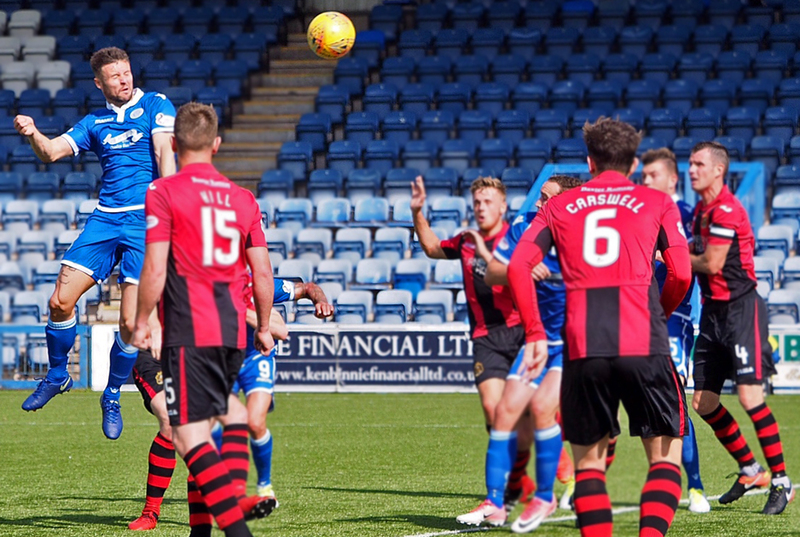 Queens were using the space on either flank very wisely, and when Darren Brownlie`s excellent 30-yard pass picked out Jordan Marshall`s run down the left, unfortunately the full backs cross went behind the onrushing Queens attackers and the chance had gone. Twelve minutes in and Queens went close again. Fordyce drilled the ball low into Dobbie and in one quick movement the striker drove a shot straight at `keeper Gallacher who saved comfortably. The visitors had hardly moved into the Queens half, and Martin was a virtual spectator for the opening phase of the game. There was a slight hold up to proceedings when Dumbarton striker Stewart fell awkwardly in midfield, and following the re-start, the game slipped into a bit of a lull with the ball spending more time either in the air, or out of play. It was clear that the gusting wind was having some effect on the game as on several occasions the gusts carried the ball further than was expected and at times made controlling the ball difficult for both sets of players. 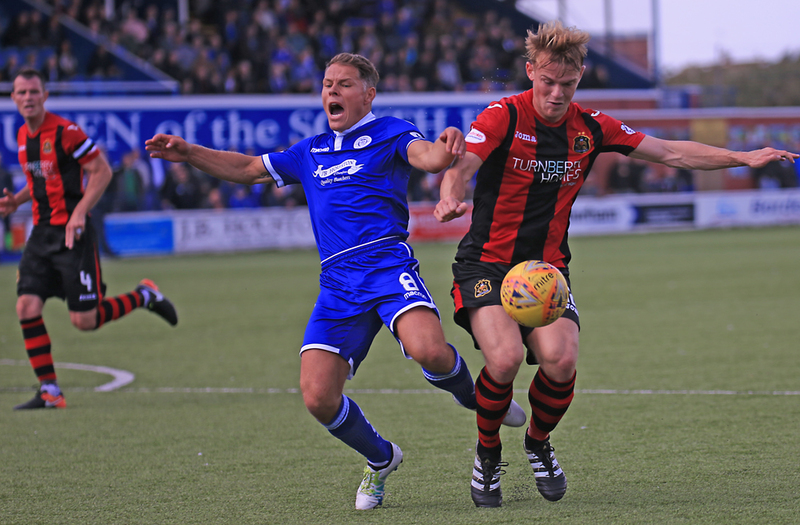 Within the space of two minutes just short of the half an hour mark, Queens had a couple of good opportunities to make the breakthrough and Dobbie was at the centre of both them. Firstly his smart control and swift footwork saw him create a chance for himself that was blocked by Hill, and then following a corner Dobbie produced a smart turn and shot that forced Gallacher to react well to prevent the ball from squeezing in at the near post. There were half-hearted appeals for a Queens penalty after 36 minutes when John Rankin went down in the box, whilst at the other end, Alan Martin was forced into action saving comfortably from a Walsh shot . Just when it appeared that the half would remain scoreless, a minute before the break, Queens broke the deadlock and once again, it was a goal from a set-piece. After winning another corner this time it was Marshall`s turn to deliver the ball, and when his cross picked out the run of Callum Fordyce the defender was able to guide his header past `keeper Gallacher. The opening period of the second half was a bit of a slow burner with both sides yielding possession on a constant basis, but as the half progressed the visitors started to show much more ambition than they had done during the first half, and a shot from Smith saw Martin called into early action to make an easy save. The visitors then won their first corner of the game and after Dowie`s header was blocked the ball fell kindly for Walsh who lacked composure and blasted the ball high over the bar. Chris Kane`s persistence won another corner for the hosts and when the ball was eventually worked back to Dobbie the striker - without a league goal so far - saw his low shot beaten away by the `keeper. Our first change saw former Dumbarton man, Andy Stirling replace Kane, and the substitute was quickly involved when he was fouled by Wardrop who was booked for the challenge. On sixty-six minutes we really should have doubled our advantage. Dobbie slipped the ball through to Stirling who broke into the box and squared the ball into the path of Lyle, but uncharacteristically his touch was heavy and the chance had gone. The game was starting to become a bit more stretched as Dumbarton added more to their attacking play and as a result, gaps were starting to appear more often in their defence, and Dobbie will feel that he should have done better when through one on one with the `keeper but could only direct his shot straight at the Dumbarton shot stopper. Queens made a double change with 16 minutes left when Lyndon Dykes, and Connor Murray, replaced Derek Lyle, and Danny Carmichael, and youngster Murray was next to create work for the Dumbarton `keeper as his shot from the edge of the box made sure that Gallacher was alive to the situation. The home fans in the crowd of 1348 were showing some signs of nerves as the away side began to threaten the Queens defence more often, although they were unable to seriously test Alan Martin. However, it has to be said that the visitors were having their best spell of the game, and although there were less than five minutes to go, with only one goal in the game the result could still have gone either way and substitute Gallagher probably should have done better than to scuff a shot wide when well placed. With Queens defending more deeply and playing on the break, Rooney`s long clearance fell nicely for Dobbie to hit on the half-volley, but although he made good contact, the direction of the strike was well off. Deep into stoppage time we had two further chances to add to the lead. Firstly Dykes showed some neat footwork to work a shooting position for himself but after the good approach play his attempted curling shot went wide of the far upright, and then almost on full-time, Dobbie went close again after being set up by Dykes but not for the first time in the game, his finish was not quite accurate enough and so we had to settle for just a single goal winning margin. 0 min The visitors have made a pre-match change ex-Queens man Craig Barr is out and Douglas Hill replaces him. 3 min Dobbie is barged over in the box but the referee waves away his claims. 7 min Encouraging start from Queens, Dobbie`s shot drifts wide. 8 min Rooney tries a shot from range but is comfortably caught by Gallacher. 9 min Marshall`s fierce cross evades Kane and Lyle in the middle of the box. 11 min Dobbie is next to try his luck but his shot is well held by Gallacher. 16 min Sons striker Mark Stewart took a nasty knock to his elbow but looks like he`ll be able to continue. 23 min Not a lot of goalmouth action here so far. 0-0 the scoreline. 24 min Rankin fouled by McLaughlin. Dobbie to take the set-piece. 25 min Dobbie`s free-kick is easily cleared by the Sons defence. 28 min Dobbie`s shot is blocked and Kane hits the ball off a defender for a Queens corner. 29 min Dobbie`s turn-and-shot is tipped wide by Gallacher. 29 min Queens continue to pressure with another corner. 32 min Dobbie`s swinging delivery is hit out for a corner. 33 min Lyle`s goalwards header is cleared. 39 min Rare Dumbarton attack, Walsh hits a shot straight into the arms of Martin. 42 min Another corner for Queens. 43 min Fordyce`s bullet header gives Queens the lead. 44 min Two-in-two for the central defender. 45 min Kane`s shot hits the defender and out for a corner. 46 min Carmichael`s low corner is cleared. 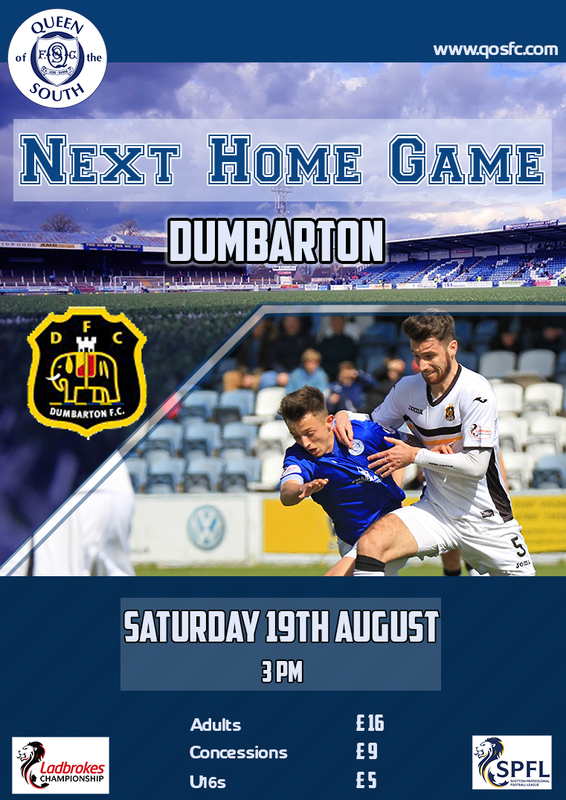 48 min Dumbarton force their first corner of the game and Dowie`s header is cleared. 56 min Marshall wins another corner and Carmichael`s set-piece is too high and powerful. 57 min Fordyce laid the ball to Dobbie and his shot is stopped on the line by Wardrop. 62 min Wardrop cautioned for a foul on Stirling. 65 min Dobbie is through one-on-one but Gallacher saves his shot. 75 min Dumbarton win a corner. 75 min The corner is cleared by Queens. Nervy stuff here at Palmy. 80 min Nervous moments for Queens, the ball drops to Gallagher in the box and he skies his effort over. 82 min Dobbie sees the keeper off his line but his dinked effort is wide. Still 1-0. 85 min Dobbie skies his shot over the bar. 87 min Dykes gets past Dowie but his shot goes wide. 89 min Dobbie`s curled effort is saved by Gallacher. 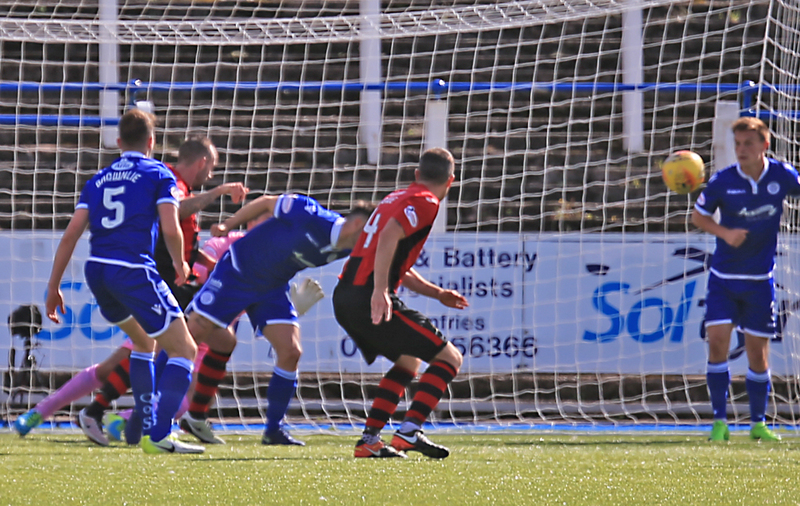 16:51 Fordyce`s second Queens goal in a week makes sure the points stay at Palmerston. 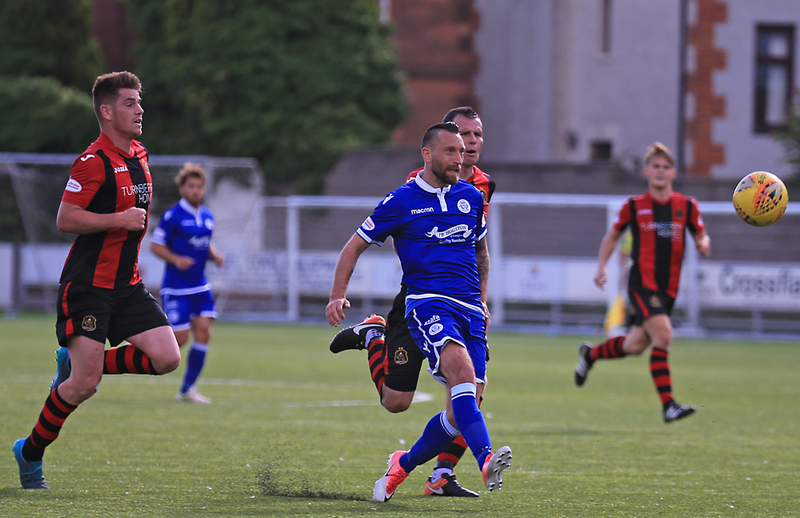 Full time Queens 1-0 Dumbarton.